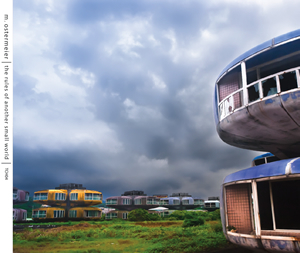 I’ll admit it; I was first intrigued with this album because of its cover, images of an abandoned sci-fi pod-style housing project in northern San-Zhr, Taiwan taken by photographer Craig Ferguson. Coincidentally, I had recently purchased the band Should’s sharply crafted album “Like A Fire Without Sound” on the Words on Music label. Little did I realize, but M. (Marc) Ostermeier is also part of Should, along with Tanya Maus & Marc’s brother, Eric. Marc is also co-owner of the Words on Music label. After rather experimental sampled-guitar beginnings in Austin, Texas, Should’s music has evolved into rather direct (and often very catchy), yet introspective, post-rock works sometimes classified as the “shoegazer” genre. Ostermeier uses electronic and acoustic instruments (piano and possibly a vibraphone) effectively and melodically throughout with various treatments. There are ambient sounds, real and electronically created. The recording is penetratingly clear and broad, but not overpowering, so the result is a very relaxing and sensuous exploration of an ethereal musical realm. This is music with a direction, not free-form ambient sounds, at all. With each subsequent listen, I hear new things and focus on different parts and counterpoints in the recordings. 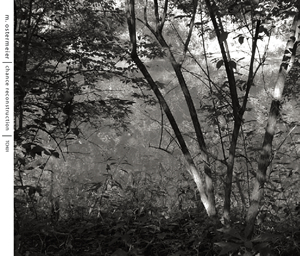 Marc previously released an equally intriguing album “Chance Reconstruction” TCH01, with another beautifully decorated sleeve of black and white forest images. This entry was posted on February 4, 2012 by wajobu. It was filed under Uncategorized and was tagged with Ambient, Darla, Electronica, Instrumental, M. Ostermeier, Music, Tench Records.